WESTMINSTER – During the many months Monsignor Arthur Valenzano battled leukemia, there was one day the longtime pastor of St. John in Westminster remembers as his absolute worst. Sitting alone in a corridor of Gemelli Hospital in Rome while awaiting an MRI test, the normally easygoing priest was anxious and annoyed. Rounds of chemotherapy had severely sapped his strength, reducing him to 150 pounds from his normal 200-pound weight. The IV that fed nutrition into his arm was particularly painful, and the hairless pastor was frustrated that his Italian wasn’t strong enough to communicate better with the staff. Feeling abandoned, Monsignor Valenzano searched the walls for a religious image that might give him solace. He found none. When a staff person finally returned and turned the priest around to take him back to his room after the test, the 58-year-old priest noticed a crucifix had been hanging over his head behind him throughout the ordeal. Now that his cancer is in remission and he has returned to his duties as pastor in Westminster, Monsignor Valenzano said his life has been changed in very profound ways. He has a deep appreciation for the transformative power of suffering, and he believes his experiences have made him a better priest. He is elated to be back at St. John and he’s determined to share God’s love with his parishioners. The priest’s journey to Rome was supposed to be a time of rejuvenation. After leading St. John’s through the successful building of a new church and the renovation of the old church into a reception hall, Monsignor Valenzano was looking forward to his six-month sabbatical in Italy in 2006. It was during a general audience with Pope Benedict XVI about a month into his sabbatical when Monsignor Valenzano began feeling feverish. After leaving the audience before the pope arrived, the priest went to an infirmary for what he thought was a bad case of the flu. But when blood tests revealed that his white blood cell count was off the charts, Monsignor Valenzano was admitted to Gemelli Hospital and immediately given chemotherapy to treat acute myeloid leukemia. 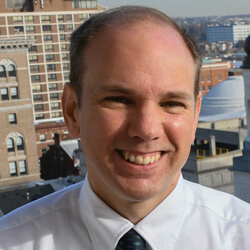 He would spend the next 40 days and 40 nights in the prominent hospital – a time Monsignor Valenzano calls “a powerful Lent.” After regaining some of his strength, the priest then was admitted to The Johns Hopkins Hospital in Baltimore. When he wasn’t responding to chemotherapy, his Hopkins’ doctors recommended a bone-marrow transplant. Although his younger brother, Francis Valenzano, was only a 51 percent match, the doctors believed his brother was a suitable donor and the transplant was performed Sept. 29, 2006, following rounds of chemotherapy and radiation treatments. The procedure has been a success, and Monsignor Valenzano will soon celebrate nearly a year of being cancer-free. As someone who has never been seriously ill and who had never been hospitalized, Monsignor Valenzano said he never considered his own mortality. But coming close to death opened his eyes. The priest said his prayer life is stronger than ever. One of the most difficult parts of being a cancer patient was not always being able to receive Holy Communion, Monsignor Valenzano said. But when he did receive, he said, it was tremendously uplifting. 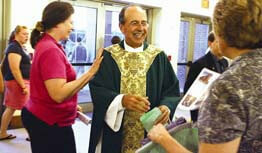 Easter always follows Lent, and Monsignor Valenzano said being back in his parish is a joy he never expected. He had resigned himself to the thought that his illness would never allow him to return as pastor. Illness has failed to dampen his warm-hearted sense of humor, and Monsignor Valenzano joked that he’s given up on re-growing his familiar mustache. Because his immune system is weak from the transplant, Monsignor Valenzano suffered a bout with pneumonia earlier this summer. His suppressed immunity prevents him from visiting the sick, and he can’t spend as much time socializing with parishioners as he would like. He will soon receive all his childhood immunizations again to protect him from diseases and he expects that in time he will gain strength. Monsignor Valenzano currently celebrates one Mass every weekend and plans to increase his administrative workload as his immunity system gets back to normal. The priest said he is deeply thankful to his doctors at Gemelli and Hopkins, as well as to the many priests, family, friends and parishioners who supported him and prayed for him. He was reluctant to name individuals, he said, because there were so many people who helped him that he didn’t want to miss anyone.